If you're like most of our customers, you probably won't have your genealogy charts out on permanent display all of the time. So that your chart will stay clean and safe when you're not viewing it, most charts (size permitting) will arrive inside of a durable, high-impact three-inch diameter, polystyrene storage tube with vinyl end-caps that can be used for permanent storage. 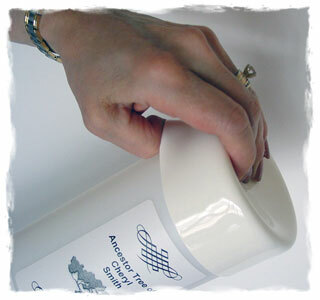 The storage tube will be labeled with the contents and date that your chart was printed. 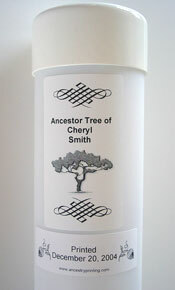 See shipping for further details about how we strive to protect the investment you make in your genealogy charts. Charts that are printed on our standard 24 lb. paper which are about 50 feet wide or less will fit in these storage tubes. If you have us print your chart on heavyweight 35 lb. paper, the maximum length that will fit in a storage tube is about 35 feet. If your chart is longer than this, we recommend that you save the original shipping container and polyethylene tubing to protect your genealogy chart for permanent storage. As you build your family tree over time, you'll probably end up printing a variety of different ancestor and descendent charts. 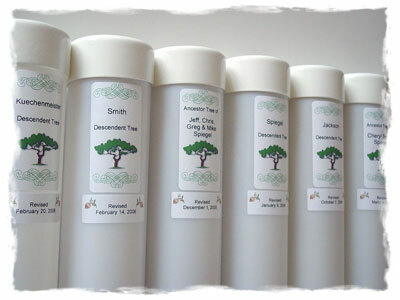 Our labeled storage tubes make the task of identifying each of your charts a breeze! And, if you're giving a chart as a gift, these storage tubes add that special touch of elegance to your very thoughtful gift. the particular genealogy chart you want to review. TIP #1: - Each time you replace the vinyl end-caps, expel the newly built-up air pressure by lifting the edge of each cap and depressing the top. This will allow air to escape from the tube and keep the end-caps from popping off of the tube. TIP #2: - Save the next cardboard tube that holiday or special occasion wrapping paper comes rolled on, and then use it as an inner core to roll your genealogy chart up. Or, another alternative is to visit your local hardware store and purchase a section of 1.5 inch diameter PVC tubing and have it cut to be the same length as your chart. Either of these options will help keep your genealogy chart wrinkle-free no matter how many times you roll it back up. We're so sure you'll love our genealogy printing services that we confidently provide a complete money back guarantee on all orders. We look forward to being able to work with you and your family so that you can enjoy all of the benefits of a printed genealogy chart. Please call us at 630-653-8400 or e-mail us at sales@ancestryprinting.com if you have any questions about our genealogy chart printing services or submitting your order. International callers can also Skype us if preferred; however, we ask that you email us to set up a convenient time for a Skype to Skype call. We are located in the central time zone of the U.S. (GMT/UTC-6 and -5 in the summer), and can make arrangements for incoming Skype to Skype calls up to around 10:00 PM local time on most nights. We only accept Skype to Skype calls that have been pre-arranged by email.